and a blog called Aboriginal Art & Culture: an American eye reviewed it way back in 2009 too. But late to the party or not, I still want to share my experience of reading this remarkable book so that perhaps by the time I again host Indigenous Literature Week in NAIDOC Week (7-14 July), more people will seek it out and read it. 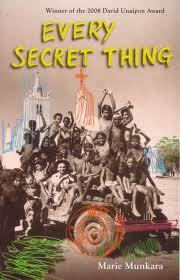 Every Secret Thing is a collection of tales of the Bush Mob and the Mission Mob in Arnhemland, beginning in the early days of missionary activity when the indigenous people did not recognise the threat to their culture. As Munkara tells it, based on the recollection of her friends and family, the Bush Mob initially found the Mission Mob comic, and they thought that they could continue to evade any impact on their way of life by taking only what they wanted from the interlopers. In one ribald, mocking tale after another, the author shows the Bush Mob trading minor irritations for what then looked like advantage to them, and making fun of the pompous intruders who come off worst time after time. The reader is lured into this early part of their story with hilarious slapstick humour, heavy with irony, and laced with biting sarcasm when revealing the extent to which the missionaries sexually abused indigenous women or trampled on cultural practices of which they were profoundly ignorant. But as time goes by the tales introduce the removal of the children of these predatory relationships and there is the heartbreaking story of Tapalinga who becomes an emblem of the Stolen Generations. Munkara’s tone becomes bitter as she recounts Tapalinga’s return to her people only to find that she doesn’t fit in any more, and that, worst of all, her mother is alienated by Tapalinga’s white ways – because that is the only way she can deal with the pain of her loss. …it was in the shower, washing off the mud and the hurt, Marigold realised that she didn’t want to be among these people anymore. She didn’t want to be different or alone or laughed at. She didn’t want to be awkward or out of place. But she didn’t understand that the time between when the child Tapalinga left and the stranger named Marigold had returned had been too long for her mother and other people to bear. The book culminates in the rise of another awful phenomenon, Black Suicides, which arose from the despair and hopelessness that the Bush Mob felt when at last they realised that their way of life had been taken from them forever. … although many people have said that my book Every Secret Thing is profoundly political, I still have difficulty seeing it that way because the issues in the book, like the removal of children, or clergy molesting children in their care, are everyday things for me. As ugly as they are, these things have happened to me and they have happened to members of my family so they fit more within the realms of the personal. But even though it wasn’t my intent to create a political work I can appreciate that others might see it that way. Every Secret Thing won the 2008 David Unaipon Award and the 2010 NT Book of the Year. It is a powerful work, which uses humour to expose confronting truths about Australian’s Black History. Marie Munkara was born on the banks of the Mainoru River in Arnhemland and now lives in Darwin. Glad you’ve read it too Lisa … I love the storytelling approach of writers like Munkara and the humour with which they tell tales that are serious at their core. I guess her comment, that you quoted, gets to the essence of the idea that the personal is the political. Oh, I love it … Sounds as good an approach as any. I shall look out for more Ms! I don’t even recall hearing about this book before! I might add it to my list of possible reads for this year. Hi Lisa, I reviewed ‘Every Secret Thing’ for ABR. It remains my favourite book of debut Aussie fiction I’ve read in the last several years. I’m think I”m right in saying that she has a new book out this year. Now that I am an online subscriber to ABR (free plug for them LOL) I can hunt out your review of Every Secret Thing easily. I am still learning to find my way around the site, but it is so much better than having to search through old volumes of the ABR in pamphlet boxes in my library!